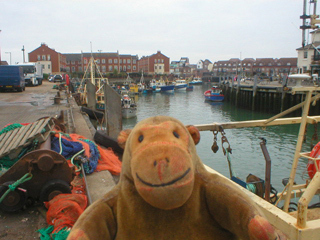 "There isn't any riotous behaviour on this street today"
Mr Monkey followed the path around the outside of the car ferry port, until he came to the Camber. This is the original medieval harbour of Portsmouth, and may have been the reason for Portsmouth being where it is. Portsmouth's small fishing fleet moors here. 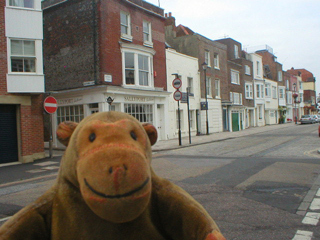 Mr Monkey trotted around the Camber and out into Broad Street. If the medieval walls had still been there Mr Monkey would have been outside them in an area known as The Point, notorious for being full of pubs, sailors and riotous behaviour.